High expression of CXCR5 is one of the defining hallmarks of T follicular helper cells (TFH), a CD4 Th cell subset that promotes germinal center reactions and the selection and affinity maturation of B cells. CXCR5 is also expressed on 20–25% of peripheral blood human central memory CD4 T cells (TCM), although the definitive function of these cells is not fully understood. The constitutive expression of CXCR5 on TFH cells and a fraction of circulating TCM suggests that CXCR5+ TCM may represent a specialized subset of memory-type TFH cells programmed for homing to follicles and providing B cell help. To verify this assumption, we analyzed this cell population and show its specialized function in supporting humoral immune responses. Compared with their CXCR5− TCM counterparts, CXCR5+ TCM expressed high levels of the chemokine CXCL13 and efficiently induced plasma cell differentiation and Ig secretion. We found that the distinct B cell helper qualities of CXCR5+ TCM were mainly due to high ICOS expression and pronounced responsiveness to ICOS ligand costimulation together with large IL-10 secretion. Furthermore, B cell helper attributes of CXCR5+ TCM were almost exclusively acquired on cognate interaction with B cells, but not with dendritic cells. This implies that a preferential recruitment of circulating CXCR5+ TCM to CXCL13-rich B cell follicles is required for the promotion of a quick and efficient protective secondary humoral immune response. Taken together, we propose that CXCR5+ TCM represent a distinct memory cell subset specialized in supporting Ab-mediated immune responses. The ability of memory T cells to mediate a faster and more effective response to secondary pathogen challenge is a central feature of adaptive immunity (1). Memory CD4 T cells are heterogeneous with respect to their homing capacities and effector function (2–6). There are two major subsets, central memory T cells (TCM) and effector memory T cells (TEM), in both human and mice. TCM typically express CD62 ligand (CD62L) and CCR7 (7, 8), and preferentially home to secondary lymphoid organs, whereas TEM lack these lymphoid homing receptors but express “inflammatory” receptors such as CCR5 and CXCR3 to gain access to inflamed peripheral tissues (9). In terms of effector function, TEM are more differentiated and polarized than TCM, and provide an immediate immune protection by rapidly producing effector cytokines on antigenic stimulation. In contrast, TCM display hypoacetylated cytokine genes, higher proliferative potential, and greater resistance to apoptosis; they have a limited effector function and are rather destined for long-term protection (10–15). It is likely that TCM might generate new waves of effector cells in secondary immune responses, whereas TEM provide immediate protection (16, 17). Within the subset of CCR7+CD45RA−CD4+ TCM in human peripheral blood, ∼20–25% expresses CXCR5 (18, 19). CXCR5 and its ligand CXCL13 are important for B cell follicle formation in secondary lymphoid organs (20). Furthermore, high expression of CXCR5 is one of the defining features of follicular B helper T cells (TFH). TFH cells are a specialized subset of CD4 T cells that localize to B cell follicles and germinal centers (GCs) in secondary lymphoid organs, where they promote the differentiation of B cells into memory B cells and plasma cells (PCs), and are crucial for the processes of somatic hypermutation of Ig variable-region gene segments and class-switch recombination (21–23). In both mice and human, TFH cells are clearly different from other Th linages. They express high levels of IL-21, CXCL13, the transcription factor B cell lymphoma 6 (Bcl-6), and costimulatory molecules including programmed cell death 1 (PD1) and ICOS (21, 24–30). The constitutive expression of CXCR5 on both TFH cells and a fraction of TCM suggests an association between CXCR5+ TCM and the GC reaction. This is supported by the finding of a deficiency in both GCs in lymphoid tissues and circulating CXCR5+CD4+ T cells in the blood of patients with mutations in CD40L or ICOS (31). However, a definitive role for these cells is still unresolved. Generally, CXCR5+ TCM have been described as relatively unpolarized cells at an early stage in effector differentiation, lacking the expression of activation markers and costimulatory molecules (18, 19, 32, 33). Their uniform expression of CD27 is quite reminiscent of naive T cells (32), and except for IL-2, CXCR5+ CD4 T cells are poorer cytokine producers compared with their CXCR5− TCM counterparts (18, 19, 32, 33). Several studies have proposed that CXCR5+ TCM represent recently activated cells (18, 33, 34). This was mainly based on the observation that recall responses to tetanus toxoid were predominantly detected within the pool of CXCR5− memory CD4 T cells isolated from volunteers vaccinated with tetanus 8–12 y ago, whereas 6 d after reimmunization, a marked proliferative response was especially observed in the CXCR5+ memory CD4 T cell pool (32, 34). Likewise, responses to allogeneic monocytes were more prominent for CXCR5+ compared with CXCR5− T cells before and after immunization with recall Ag (34). Moreover, CXCR5 expression is typically observed on all T cells after antigenic simulation both in vivo and in vitro (34–37). CXCR5 expression on T cells after stimulation is, however, only transient and irreversibly lost after their terminal differentiation into different effector Th lineages like Th1, Th2, Th17, or Th22. An exception is TFH cells that maintain high levels of CXCR5, as well as the subpopulation of CXCR5+ TCM within human peripheral blood (18, 19, 30, 33, 38–40). Thus, the original assumption that circulating CXCR5+ CD4 T cells represent recently activated cells may be correct for some, but not all, of these cells. The expression of CXCR5 on a subset of peripheral blood TCM, as well as tonsillar TFH cells, begs the question of whether circulating CXCR5+ CD4 T cells represent a type of TFH memory cell, programmed for preferential recruitment to follicles and GCs. Comparative gene expression analysis, however, revealed major differences between tonsillar and peripheral blood CXCR5+ CD4 T cell subsets (29), suggesting that CXCR5+ TCM follow a differentiation pathway distinct from that of TFH cells. Despite this, the observation of a parallel reduction in GCs and circulating CXCR5+ CD4 T cells in ICOS and CD40L-deficient patients (31) suggests there might exist an association between the GC reaction and peripheral blood CXCR5+ CD4 T cells. To obtain insight into the function of human CXCR5+ TCM in peripheral blood, we performed a detailed characterization of this cell population as compared with their peripheral blood CXCR5− counterpart, as well as bona fide TFH cells present in human tonsils. We used different stimulatory and costimulatory conditions to carefully study the differentiation of these cell subsets and set the focus on clarifying the relation between CXCR5+ TCM, TFH, and the humoral immune response. In this study, we show that CXCR5+ TCM represent a distinct memory cell population specialized in supporting B cell-related immune responses. Compared with their CXCR5− TCM counterparts, CXCR5+ TCM efficiently induced PC differentiation and Ig secretion, and displayed a different profile in terms of cytokine and costimulatory molecule expression. The observation that the adoption of B cell helper attributes by CXCR5+ TCM required cognate interactions with B cells suggests that a preferential recruitment of these cells to CXCL13-rich B cell follicles may be necessary to implement a quick and efficient protective humoral immune response. The following Abs were used: purified and FITC- or PE-conjugated anti-CCR7 (R&D Systems); purified (R&D Systems) or biotinylated (BD) anti-CXCR5, FITC-, or PE-conjugated anti-CD45RA (Immunotech); PerCP-Cy5.5–labeled anti-CD45RA (eBioscience); biotinylated anti-Ig G2a (Southern Biotech); biotinylated anti-Ig G2b (Southern Biotech); FITC- or PE-conjugated anti-Ig G2a (Southern Biotech); FITC- or PE-conjugated anti-Ig G2b (Southern Biotech); streptavidin-Pacific blue (Molecular Probes; Invitrogen); streptavidin-APC (eBioscience); FITC- or PE-conjugated anti-TCRVβ2 (Immunotech); PE-Cy7–conjugated anti-CD4 (BD Biosciences); Pacific blue-labeled anti-CD4 (BioLegend); APC-, FITC-, or PE-Cy5–labeled anti-CD4 (Immunotech); FITC- or APC-conjugated anti-CD20 (BD Biosciences); PE-Cy5–conjugated anti-CD25 (Immunotech); PE-conjugated anti-CD25 (BD); APC-Cy7–conjugated anti-CD25 (eBioscience); PE-Cy5–conjugated anti-CD8 (Immunotech); PE-Cy5–conjugated anti-CD14 (Immunotech); PE-Cy5–conjugated anti-CD16 (Immunotech); FITC- or PE-Cy5–labeled anti-CD19 (Immunotech); PE-Cy5–conjugated anti-CD56 (Immunotech); APC-, FITC-, or PE-Cy5–labeled anti-CD3 (Immunotech); Pacific blue-labeled anti-CD3 (BioLegend), PE-Cy5–labeled anti-CD38 (Immunotech); APC-labeled anti-CD38 (BD); PE-labeled anti–IL-10 (BD Biosciences); Pacific blue-labeled anti–IL-10 (eBioscience); PE-labeled anti–IL-4 (BD Biosciences); PE-Cy7–labeled anti–IL-4 (eBioscience); PE-labeled anti–IL-22 (R&D Systems); Alexa Fluor 647-labeled anti–IL-21 (eBioscience); PE-labeled anti–IL-21 (eBioscience); APC-labeled anti–IFN-γ (BD Biosciences); Pacific blue-labeled anti–IFN-γ (BioLegend); PE-labeled anti–IL-17 (eBioscience); Alexa Fluor 647-labeled anti–IL-17 (eBioscience); PE-labeled anti-CCR6; biotinylated anti–IL-23R; PE-labeled anti-CCR10 (R&D Systems); Alexa Fluor 647-labeled anti-CD294 (BD); FITC-labeled anti-CD57 (BD); biotinylated anti-ICOS (eBioscience); PE-labeled anti-PD1 (eBioscience); PE-labeled anti-OX40 (BD); PE-labeled anti-CD40L (BD); neutralizing anti–IL-10 (BD); and neutralizing anti-B7RP1. Buffy coats from healthy donors were obtained from the Basel Swiss Blood Center and Australian Red Cross Blood Service, spleens from organ donors were obtained from Australian Red Cross Blood Service, and human tonsils were obtained from routine tonsillectomy at St. Vincent’s Hospital (Darlinghurst, NSW, Australia). Permission for experiments with human primary cells was obtained from the Swiss Federal Office of Public Health (A000197/2 to F.S.) and by the jurisdictional ethics committees in Sydney, NSW, Australia. CD4+ T cells were isolated from peripheral PBMCs or tonsillar mononuclear cells by positive selection with CD4-specific microbeads (130-045-101; Miltenyi Biotec); B cells from PBMCs or splenic mononuclear cells were isolated by positive selection with CD19-specific microbeads (130-050-301) and sorted as CD19+CD20+ total B cells, CD20+CD27− naive cells, and CD20+CD27+ memory B cells. Circulating conventional dendritic cells (cDCs) and plasmacytoid dendritic cells (pDCs) were isolated by positive selection after staining PBMCs with FITC-labeled anti–BDCA-1 (AD5-8E7) and PE-labeled anti–BDCA-4 (AD5-17F6), respectively, followed by positive selection with anti-FITC (130-048-701) or anti-PE microbeads (130-048-801; all from Miltenyi Biotec) and cell sorting as BDCA-1+CD19−CD14− and BDCA-4+CD19−CD14− cells. CXCR5+ and CXCR5− TCM (Supplemental Fig. 1) were either selected as CD4+CD45RA−CCR7+CD25− or as CD45RA−CCR7+CD8−CD16−CD56−CD14−CD19−, TEM as CD4+CD45RA−CCR7−, and naive CD4 T cells as CD4+CD45RA+CCR7+CXCR5− cells. Where indicated, toxic shock syndrome toxin (TSST)-reactive T cell subsets were sorted as CD4+ Vβ2+ cells. Tonsillar CD4 T cells were sorted into populations of naive CD4+CD45RA+CXCR5−, CD4+CD45RA−CXCR5lo, CD4+CD45RA−CXCR5int, and CD4+CD45RA−CXCR5hi TFH cells as described previously (30). Cells were sorted with a FACSAria (BD Biosciences). Purity of sorted cells was in general >95%. Cells were cultured in RPMI 1640 medium supplemented with 2 mM glutamine, 1% (v/v) nonessential amino acids, 1% (v/v) sodium pyruvate, penicillin (50 U/ml), streptomycin (50 μg/ml), kanamycin (50 μg/ml) (all from Life Technologies), and 10% (v/v) FBS (Hyclone). For all studies, sorted memory CD4 T cells were rested overnight. To determine ex vivo surface CD40L expression, we stimulated cells for 1 h in the presence of PMA and ionomycin (Sigma-Aldrich). Ex vivo intracellular cytokine expression was examined after 5-h stimulation with PMA and ionomycin (Sigma-Aldrich) in the presence of brefeldin A (Sigma-Aldrich) for the final 2.5 h of culture. Ex vivo cytokine secretion in culture supernatants was measured by ELISA after 24-h stimulation with plate-bound anti-CD3 (clone TR66, 2 μg/ml) and 50 nM phorbol-12-13-dibutyrate (PdBu; Sigma-Aldrich), and ex vivo mRNA expression by RT-PCR without further stimulation or after 4-h stimulation with PMA/ionomycin (Sigma-Aldrich). Cytokine production, surface receptor expression, and mRNA levels were further examined after 48-h stimulation on plate-bound anti-CD3 (clone TR66, 2 μg/ml) and anti-CD28 mAbs (2 μg/ml; BD Biosciences), as well as anti-CD3 (clone TR66, 2 μg/ml) and recombinant human ICOS ligand (ICOS-L) (B7-H2/Fc chimera [5 μg/ml; R&D Systems]). For B cell–T cell coculture, purified TSST-responsive Vβ2+ CD4 T cell subsets were incubated with autologous CD20+CD19+ B cells at a ratio of 1:1 in the presence of 100 ng/ml TSST-1 (Toxin Technology). Alternatively, purified CD4 T cells subsets were incubated with allogeneic B cells at a ratio of 1:1 in the presence or absence of T cell activation and expansion beads (Miltenyi Biotech). After 5–6 d of culture, B and T cells were examined for surface phenotype and intracellular cytokine expression as described earlier, and for secretion of IgM, IgG, and IgA by ELISA (30, 41, 42). Activation of CD4 T cells by different APCs was performed by incubating purified TSST-responsive Vβ2+ CD4 T cells for 24 h with autologous cDCs, pDCs, and B cells. For this, sorted cDCs, pDCs, and B cells were first matured for 14 h in complete medium supplemented with LPS (100 ng/ml, from Escherichia coli; Sigma), CpG 2006 DNA (5 μg/ml; Molecular Probes), or F(ab′)2 goat anti-human IgM/IgA/IgG (H+L) (Jackson Immunoresearch), respectively. Matured APCs were then pulsed for 1 h in the presence of 100 ng/ml TSST-1 (Toxin Technology) before purified CD4 T cell subsets were added. Purified B cells were cultured with recombinant CD40L (41, 42) alone or together with 100 U/ml human IL-10 (DNAX), 50 ng/ml human IL-21 (PeproTech), 50 ng/ml human IL-17A, or 100 U/ml human IFN-γ (PeproTech), and levels of secreted Ig were measured by ELISA as described earlier. Cytokine concentrations in culture supernatants were assessed by ELISA according to standard protocols and analyzed with the Softmax program. Total Ig produced in culture supernatants were measured using IgG-, IgA-, and IgM-specific ELISA; Abs used were from Southern Biotech. Certified Reference Material 470 (ERM-DA470, Institute for Reference Materials and Measurements) (43) and human Ig standards (Sigma) were used as standard material for Ig isotype quantification. Intracellular cytokine expression was detected after restimulation of cells with PMA and ionomycin in the presence of 10 mg/ml brefeldin A (Sigma-Aldrich). Cells were then fixed and permeabilized with BD Cytofix/Cytoperm Plus (BD Bioscience) according to the manufacturer’s instructions and incubated with the respective Abs. Apart from CD40L expression, requiring 1-h stimulation in the presence of PMA and ionomycin, the expression of chemokine receptors and surface and costimulatory molecules was performed without further restimulation. After staining, cells were washed, acquired on FACSCalibur (BD Biosciences) or FACSCantoII (BD Biosciences), and analyzed using the FlowJo software (Tree Star). Total RNA was extracted using TRIzol reagent (Invitrogen) according to the manufacturer’s instructions. Random hexamer primers and an Moloney murine leukemia virus reverse transcriptase kit (Invitrogen) were used for cDNA synthesis. Transcripts were quantified by real-time quantitative PCR on an ABI PRISM 7700 Sequence Detector with predesigned TaqMan Gene Expression Assays and reagents according to manufacturer’s instructions (Perkin-Elmer Applied Biosystems). Probes with the following Applied Biosystems assay identification numbers were used: GATA-3 Hs00231122_m1; Il-4 HS00174122_m1; RORC Hs01076112_m1; TBX21 Hs00203436_m1; Bcl-6 Hs00277037_m1; Il-21 Hs00222327_m1; Il-10 Hs00961622_m1; cMAF Hs00193510_m1; cxcl13 Hs00757930. For each sample, mRNA abundance was normalized to the amount of 18S rRNA and is presented in arbitrary units. Alternatively, RT-PCR primers (Integrated DNA Technologies, Coralville, IN) were designed using the Roche UPL Primer Design Program, and RT-PCR was carried out using the Roche LightCycler 480 Probe Master Mix and the Roche LightCycler 480 System. All reactions were standardized to the level of expression of the housekeeping gene GAPDH. Naive CD4 T cells, TEM, and CXCR5+ and CXCR5− TCM were purified as described earlier and total RNA extracted using TRIzol reagent (Invitrogen) according to the manufacturer’s instructions. For each population, biotin-labeled cRNA was amplified from 30 ng RNA using the two-cycle cDNA synthesis kit (Affymetrix) as per manufacturer’s instructions. Biotin-labeled cRNA was hybridized to U133plus2 Affymetrix arrays, which were then washed, stained, and scanned as per the manufacturer’s protocol. The raw Affymetrix array data were normalized by the RMA method using GeneSpring GX 7.3.1 software (Agilent). Detailed descriptions of each microarray experiment are provided online at http://www.ncbi.nlm.nih.gov/geo (accession number GSE26928). Differences between data sets were analyzed as indicated by either Student t test or one-sample t test with a hypothetical mean value of 1. It has been well established that CXCR5 expression is associated with an increased capability of human tonsillar CD4+ T cells to provide B cell help and support Ig production (Supplemental Fig. 2) (29, 30, 33, 41). We therefore asked whether CXCR5+ TCM, as compared with CXCR5− TCM, were more efficient in inducing PC differentiation and Ig secretion when cocultured with B cells. To this end, sorted TSST-responsive Vβ2+CXCR5+ or Vβ2+CXCR5− TCM were cocultured with autologous B cells in the presence of TSST for 5–6 d. Both T cell subsets induced a CD38hiCD20− plasmablast phenotype from cocultured B cells (Fig. 1A, 1B) and supported Ig secretion (Fig. 1C, 1D). 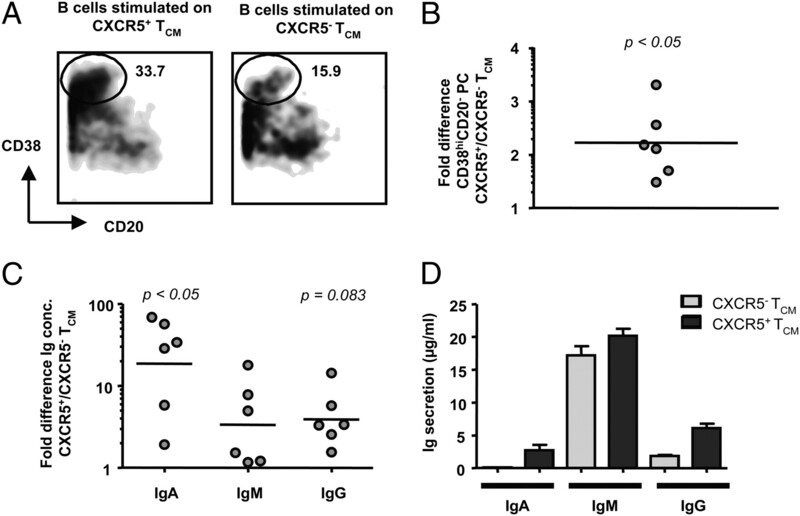 However, PC differentiation and Ig secretion were significantly increased when B cells were cultured with CXCR5+ TCM compared with CXCR5− TCM. Comparable results were also achieved when CXCR5+ and CXCR5− TCM were cocultured in the presence of naive allogeneic B cells and anti-CD3 and anti-CD28 mAbs (Supplemental Fig. 2) or in the presence of allogeneic B cells without further stimulation (as described later). Considering the absolute number of B cells recovered after culture on CXCR5+ or CXCR5− TCM, we observed no difference between the two subsets in our allogeneic coculture (Supplemental Fig. 3) and only minor differences in the autologous coculture experiments (data not shown). We therefore assume that increased induction of plasmablast differentiation underlies the increased Ig secretion in the presence of CXCR5+ TCM, which is consistent with the generation of a greater frequency of cells with a CD38hiCD20− phenotype by CXCR5+ TCM compared with CXCR5− TCM (Fig. 1A, 1B). CXCR5+ TCM provide more efficient B cell help. A–D, Purified Vβ2+ CXCR5+ or CXCR5− TCM were incubated with purified autologous CD19+CD20+ B cells in the presence of TSST. After 5–6 d of culture, cells and supernatants were harvested. The frequency of B cells with a CD38hiCD20− phenotype was determined by flow cytometry (A, B), and the levels of secreted IgM, IgA, and IgG were measured by ELISA (C, D). Ig levels (C) and the frequency of cells with a CD38hiCD20− phenotype (B) are shown as fold difference of CXCR5+ TCM as compared with CXCR5− TCM. Each symbol represents cells obtained from different donors. The p value was calculated using one-sample t test of the fold difference between CXCR5+ and CXCR5− TCM with a hypothetical mean value of 1 (CXCR5+ TCM = CXCR5− TCM). Also displayed are dot plots with gates set on CD38hiCD20− PCs (A) and the Ig ELISA of one representative donor (D). We further used the earlier described allogeneic coculture approach to compare B cell helper capabilities of peripheral blood CXCR5+ and CXCR5− TCM directly with tonsillar CD4 T cell subpopulations (naive CD4+CD45RA+CXCR5−, CD4+CD45RA−CXCR5lo, CD4+CD45RA−CXCR5int, and CD4+CD45RA−CXCR5hi T cells). When cultured in the presence of splenic naive B cells and anti-CD3/CD28 mAbs, tonsillar CXCR5int CD4 T cells yielded the highest amounts of Ig secretion among tonsillar CD4 T cell subsets (Supplemental Fig. 2), consistent with previous studies reported by Ma et al. (30) and Rasheed et al. (29). The reduced “help” provided by TFH cells most probably reflects their limited proliferative capacity and increased susceptibility to apoptosis because of elevated expression of CD95, PD1, and other regulatory molecules such as BTLA and CD200 (all of which are absent from TCM cells) (29, 30, 44). Interestingly, peripheral blood cells were more efficient in inducing Ig secretion than all tonsillar subsets (Supplemental Fig. 2). However, these results need to be interpreted with caution. Ideally, tonsillar and peripheral blood cell subsets from the same donor should be compared; however, it is logistically challenging to obtain blood and tissues simultaneously from the same individual. Furthermore, because they originate from highly inflamed tissue, tonsillar CD4 T cells may mostly be at a state of final differentiation, prone to apoptosis and with less proliferative capacity than TCM. We next wondered whether CXCR5 expression on circulating CD4 T cells correlates with higher expression of molecules that are important for B cell-related immune responses and are typically upregulated on TFH cells (18, 19, 21, 24, 29, 30, 35). In previous studies, the association between CXCR5 expression on circulating CD4 T cells and Th-lineage polarization mainly focused on Th1 and Th2 cells (18, 32, 33). Recently, however, a growing number of additional Th lineages, TFH, Th9, Th22, and Th17, have been described. Thus, our first aim was to identify whether, within the central memory population, CXCR5+ TCM are skewed toward the TFH effector lineage rather than any other Th lineage. We assessed global gene expression patterns in naive CD4 T cells, CXCR5− and CXCR5+ TCM, and TEM using microarray analyses (Fig. 2). As expected, naive CD4 T cells displayed a less and TEM a more polarized phenotype than TCM. These differences were most clear with respect to transcription factors (Bcl-6, cMAF, GATA-3, RORα, RORγt, signaling lymphocyte-activation molecule-associated protein [SAP], T-bet), chemokine and cytokine receptors (CCR5, CCR6, CCR7, CCR10, CXCR4, CRTh2, IL-23R), and costimulatory molecules (CD40L, CD57, CTLA-4, Fas, ICOS, OX40, PD1), whereas transcript levels of cytokines (CXCL13, IFN-γ, IL-2, IL-4, IL-10, IL-17α, IL-21, IL-22) were generally low. The gene expression profiles of CXCR5+ and CXCR5− TCM showed only minor differences, with CXCR5− TCM appearing to be more differentiated than CXCR5+ TCM. Key TFH markers such as signaling lymphocyte-activation molecule-associated protein (SAP), Bcl-6, and CXCL13 were, however, hardly expressed by any of the subsets examined, consistent with the data reported by Rasheed et al. (29). Differentially expressed genes in peripheral blood subsets of CD4 T cells. Heat map showing relative expression levels of selected genes related to cell migration, signaling, transcription, and differentiation. Data are derived from two independent donors for each T cell subset examined on separate chip analyses (marked as 1 and 2). To further confirm these observations, we examined highly purified CXCR5+ versus CXCR5− CD4+CD45RA−CCR7+CD25− TCM for differential expression of Th-lineage–specific cytokines, surface markers/costimulatory molecules, and transcription factors by quantitative RT-PCR, flow cytometry, and ELISA. We used highly purified tonsillar CD4+CD45RA−CXCR5hi TFH cells as a control, which typically express highest levels of B cell helper-associated molecules (IL-10, IL-21, OX40, PD1, ICOS, Bcl-6, and CXCL13) (Supplemental Figs. 4–6) (18, 19, 21, 24, 29, 35). Cytokine expression was assessed by flow cytometry after polyclonal stimulation with PMA and ionomycin for 5 h (Fig. 3A, Supplemental Fig. 6, Table I), whereas cytokine secretion was measured by ELISA after 24-h stimulation with plate-bound anti-CD3 and PdBu (Fig. 3B, Supplemental Fig. 7). For IL-4, IL-10, and IL-21, we additionally compared mRNA levels in CXCR5+ and CXCR5− TCM after 3- to 4-h stimulation with PMA and ionomycin (Fig. 3C), because IL-10 and IL-4 were hardly detectable by flow cytometry or ELISA, respectively, and IL-21 was not reliably detectable by ELISA as it was probably consumed by the cells themselves (data not shown). Within the two subsets, CXCR5− TCM generally displayed a higher cytokine-producing capacity compared with CXCR5+ TCM. IL-17, IL-22, IL-4, and IFN-γ were all produced at higher levels by CXCR5− TCM, whereas IL-21 was equally expressed between the two subsets. IL-10 was the only cytokine found to be increased in CXCR5+ TCM. CXCR5+ and CXCR5− TCM are differently polarized; a TFH-like polarization is, however, apparent in neither subset. A, Freshly purified CXCR5+ and CXCR5− TCM were stimulated by PMA and ionomycin for 5 h, and expression of IL-21, IL-4, IFN-γ, IL-17, and IL-22 analyzed by flow cytometry. Cytokine expression levels are shown as fold difference of CXCR5+ TCM as compared with CXCR5− TCM. B, Freshly purified CXCR5+ and CXCR5− TCM were stimulated with anti-CD3 and PdBu, and IL-10, IFN-γ, IL-17, and IL-22 measured in 24-h culture supernatant. Cytokine levels are shown as fold difference of CXCR5+ TCM as compared with CXCR5− TCM. C, The abundance of RNA encoding for IL-17, IL-4, GATA-3, RORγt, T-bet, Bcl-6, IL-21, IL-10, and cMAF was determined by quantitative PCR after purification of CXCR5+ and CXCR5− TCM and 4-h stimulation with PMA and ionomycin. mRNA expression levels are shown as fold difference of CXCR5+ TCM as compared with CXCR5− TCM. A–C, Each symbol represents cells obtained from different donors. The p value was calculated using one-sample t test of the fold difference between CXCR5+ and CXCR5− TCM with a hypothetical mean value of 1 (CXCR5+ TCM = CXCR5− TCM). D, Freshly purified CXCR5+ and CXCR5− TCM were analyzed by flow cytometry for the expression of surface makers as indicated. Each symbol represents cells obtained from different donors. The p value was calculated using paired Student t test. Previous studies revealed preferential expression of CXCR3 and CCR4, chemokine receptors associated with Th1 and Th2 cells, respectively (45, 46), on CXCR5− TCM (32). We therefore analyzed expression of a panel of chemokine receptors and surface molecules on highly purified CXCR5+ TCM and CXCR5− TCM (Fig. 3D). CRTh2 and CCR10, which are typically expressed on IL-22–secreting cells (47), were increased on CXCR5− TCM. CCR6 and IL-23R, preferentially expressed by Th17 cells (48–50), were equally expressed between the two subsets. No differential expression was furthermore observed for CD57, ICOS, and PD1 (Table II, Supplemental Fig. 5) and the costimulatory molecules CD40L and OX40 (Table II, Supplemental Fig. 5). Consistent with a more pronounced resemblance to Th1, Th2, Th22, and Th17 features, CXCR5− TCM displayed higher levels of transcription factors GATA-3 and RORγt, whereas T-bet was equally expressed between the two subsets (Figs. 2, 3C, Supplemental Fig. 4). No difference in expression of the TFH-associated markers CXCL13 and Bcl-6 was observed between CXCR5+ and CXCR5− TCM, with CXCL13 being below detection level in most cells (Fig. 3C, Supplemental Fig. 4). The only transcription factor that was increased in CXCR5+ over CXCR5− TCM was cMAF (Figs. 2, 3C). In summary, CXCR5+ TCM display a relatively unpolarized phenotype and lack expression of key TFH markers when examined ex vivo. We hypothesized that the true relevance of CXCR5+ TCM cells might be evident only after activation because cells may differentiate and adopt effector function. Previous studies by Rivino et al. (32) established that chemokine receptors on TCM could discriminate cells with predetermined fates. CXCR3 and CCR4 were expressed on two subsets of TCM cells, which spontaneously differentiated to Th1 and Th2 effector cells, respectively (32). We therefore asked whether expression of CXCR5 on TCM identifies them as pre-TFH memory cells that are capable of rapidly adopting TFH-related features and functions when engaged in immune responses. Based on the rapid kinetics of the memory response on secondary Ag encounter, we assessed cytokine production by purified CXCR5+ and CXCR5− TCM after in vitro stimulation for 48 h. Considering the importance of ICOS costimulation in GC reactions and secondary humoral immune responses (51–53), we stimulated the two cell subsets on CD3/CD28 and CD3/ICOS-L, and measured production of IL-17, IL-10, IL-22, IL-21, IL-4, and IFN-γ by ELISA (Fig. 4A) and/or intracellular cytokine staining (Fig. 4B–E) and/or RT-PCR (Supplemental Fig. 8). Because of weak intracellular expression of IL-22 and IL-4 after 48 h of stimulation, the cells were additionally examined after a consecutive stimulation on plate-bound CD3/CD28 or CD3/ICOS-L for 2 d, followed by 3-d expansion in the absence of stimulus. In vitro stimulation of CXCR5+ and CXCR5− TCM induces different cytokine expression profiles, with CXCR5+ TCM displaying a notable responsiveness toward ICOS-L costimulation. A and B, Cytokine production by freshly purified CXCR5− and CXCR5+ TCM stimulated in vitro for 48 h with either anti-CD3/CD28– or anti-CD3/ICOS-L–coated plates, followed by cytokine ELISA of culture supernatants (A) and intracellular cytokine staining after restimulation with PMA and ionomycin (B). Each symbol represents cells obtained from different donors; p value was calculated using paired t test; small horizontal bars indicate the mean. C–E, Representative dot blots of cytokine production by freshly purified CXCR5− and CXCR5+ TCM treated as described for B. Under in vitro stimulatory conditions, CXCR5+ TCM no longer presented themselves as unpolarized or resting cells, but rather displayed a profile and stimulus responsiveness that was distinct from CXCR5− TCM. Most prominent was the increased expression of both IL-10 and IL-17 by CXCR5+ TCM especially after stimulation on CD3/ICOS-L. CXCR5+ TCM furthermore expressed more IL-21 compared with CXCR5− TCM; highest levels were, however, achieved in the presence of CD3/CD28. In accordance with their polarization when examined ex vivo, CXCR5− TCM also expressed higher IL-22 levels after stimulation. The same trend was detected for IL-4, albeit its production by both TCM subsets was very low. The results for IFN-γ expression, and to a lesser extent for IL-17 expression, as measured by flow cytometry and secretion as measured by ELISA were not fully concordant. We believe this can be explained by the different techniques used to determine IL-17 and IFN-γ production. Whereas ELISA measures the accumulative amount of cytokines produced during a distinct period, intracellular cytokine staining rather reveals the potential of activated cells to express cytokines after 5-h restimulation with PMA/ionomycin. Even if cytokine expression levels and the amount of cytokine secreted in culture supernatants are not fully concordant, the results clearly show that IFN-γ was expressed and secreted at high levels by both subsets, with CXCR5+ TCM again revealing high responsiveness toward ICOS-L stimulation yielding the greatest expression of IFN-γ. Because of the higher capacity of CXCR5+ TCM to produce B helper cytokines, especially IL-10, and to a lesser extent IL-21, we next asked whether in vitro stimulation also resulted in a preferential upregulation of expression of molecules that are typically associated with B cell help and expressed by TFH cells, such as Bcl-6, CXCL13, CD57, ICOS, CD40L, or OX40 (Supplemental Figs. 4–6) (21–23, 30). The transcription factor Bcl-6 is highly expressed by TFH cells (Supplemental Fig. 4) (24, 29) (30) and is required for the TFH-lineage differentiation (54–56). In vitro stimulation with CD3/CD28 or CD3/ICOS-L resulted in a Bcl-6 upregulation by both CXCR5+ and CXCR5− TCM, with only a very slight trend for greater expression by CXCR5+ TCM (Fig. 5A). Differential production of CXCL13 and increased levels of cMAF and ICOShi by CXCR5+ TCM after plate-bound in vitro stimulation. A, B, and E, Expression of Bcl-6 mRNA (A), CXCL13 mRNA (B), and RORγt and cMAF mRNA (E) determined by quantitative PCR of purified CXCR5− and CXCR5+ TCM before and after in vitro stimulation for 48 h on anti-CD3/CD28– or anti-CD3/ICOS-L–coated plates. C, CXCL13 secretion determined by ELISA in culture supernatants of purified CXCR5− and CXCR5+ TCM stimulated in vitro for 5 d with either anti-CD3/CD28– or anti-CD3/ICOS-L–coated plates. D, Expression of ICOS, CD40L, and CD57 as determined by flow cytometry after in vitro stimulation of purified CXCR5+ and CXCR5− TCM for 48 h with either anti-CD3/CD28– or anti-CD3/ICOS-L–coated plates. Depicted are graphs with each symbol representing cells obtained from different donors. In addition, dot plots of ICOS and CD40L expression are shown for CXCR5+ and CXCR5− TCM before and after stimulation. The rectangle in the representative dot plots (left and middle panels) marks CD40L/ICOS negative versus positive cells, whereas the gate in the right panels marks ICOShi cells. A–E, Each symbol represents cells obtained from different donors. For stimulated cells, p value was calculated using paired t test; small horizontal bars indicate the grand mean. CXCL13 is another molecule that is produced in high quantities by TFH cells (Supplemental Fig. 4) (29) and is abundantly expressed in the GC light zone (57). When examined ex vivo, CXCL13 expression was detectable neither in CXCR5− nor CXCR5+ TCM. However, in vitro stimulation with CD3/ICOS-L resulted in a marked increase of CXCL13 mRNA levels particularly in CXCR5+ TCM compared with CXCR5− TCM (Fig. 5B). This heightened responsiveness of CXCR5+ TCM to ICOS-L costimulation for production of CXCL13 was also confirmed by ELISA (Fig. 5C). TFH cells typically express high levels of ICOS (Supplemental Fig. 5) and CD40L (30), costimulatory molecules involved in interactions between T and B cells. More than 85–95% of both CD4 T cell subsets expressed CD40L or ICOS at 48 h poststimulation (Fig. 5D). Generally, CD3/CD28 stimulation resulted in a stronger and quicker ICOS upregulation than CD3/ICOS-L stimulation (data not shown), which might be explained by a possible receptor downregulation caused by engagement. Although CXCR5+ and CXCR5− TCM did not differ with respect to CD40L expression levels, CXCR5+ TCM displayed a greater percentage of ICOShi cells (Fig. 5D), which might explain the observed higher responsiveness toward ICOS-L stimulation (Figs. 4A–E, 5B, 5C). We further examined expression of CD70, which in cooperation with IL-10 directs the differentiation of CD27+ memory B cells toward PC (58), and of CD57, which is highly expressed by the subset of human TFH cells (19, 24, 25, 29, 30). CD70 displayed a slightly delayed upregulation as compared with CD40L but was finally expressed by >90% of both CD4 T cell subsets (data not shown), whereas CD57 was hardly expressed at all time points (Fig. 5D). Because the high IL-17 secretion by CXCR5+ TCM was quite surprising, we questioned whether this was paralleled by an increased upregulation of the Th17-lineage–specific transcription factor RORγt or cMAF. The latter was recently shown to be induced by ICOS engagement and to regulate proliferation of and IL-21 production by Th17 and TFH cells (59). It was also expressed at slightly higher levels in CXCR5+ TCM ex vivo (Fig. 3C). Whereas after 48 h of in vitro stimulation RORγt mRNA levels were nearly equivalent between the subsets, cMAF mRNA levels again reached higher expression levels in CXCR5+ TCM and preferentially in the presence of ICOS-L (Fig. 5E). So far, we observed greater B cell helper function by CXCR5+ TCM as compared with their CXCR5− counterpart. Even if CXCR5+ TCM did not differentiate into archetypal TFH cells under the chosen conditions, they at least adopted a phenotype that was different from CXCR5− TCM and may point toward their specialized commitment to support humoral immune responses. We next wondered whether stimulation in the presence of B cells would result in the acquisition of the same phenotypic characteristics and hence explain the better B cell helper functions of CXCR5+ TCM. After 5 d of stimulation on B cells, CXCR5+ TCM again expressed significantly increased levels of IL-10 as compared with CXCR5− TCM (Fig. 6A). IL-21 and IFN-γ levels were expressed at similar levels by both CXCR5+ and CXCR5− TCM, whereas plate-bound CD3/CD28/ICOS-L stimulation resulted in a slightly higher expression of IL-21 by CXCR5+ TCM; IL-17 and IL-4 were only weakly expressed, but in accordance with stimulation on plate-bound CD3/CD28 and CD3/ICOS-L, CXCR5+ TCM displayed slightly decreased IL-4 but increased IL-17 levels (Fig. 6A). As already observed after plate-bound stimulation, CXCL13 was significantly upregulated in CXCR5+ TCM relative to CXCR5− TCM (Fig. 6B). Activated CXCR5+ TCM also generated a greater frequency of cells exhibiting an ICOShiCD57+ phenotype than CXCR5− TCM (Fig. 6C). Bcl-6 was not differentially regulated between the two subsets (Fig. 6B). After 5 d of coculture with B cells, we furthermore found a significant downregulation of CD40L and CD70 on both CXCR5+ and CXCR5− TCM, most probably caused by receptor-mediated downregulation (data not shown) (60). 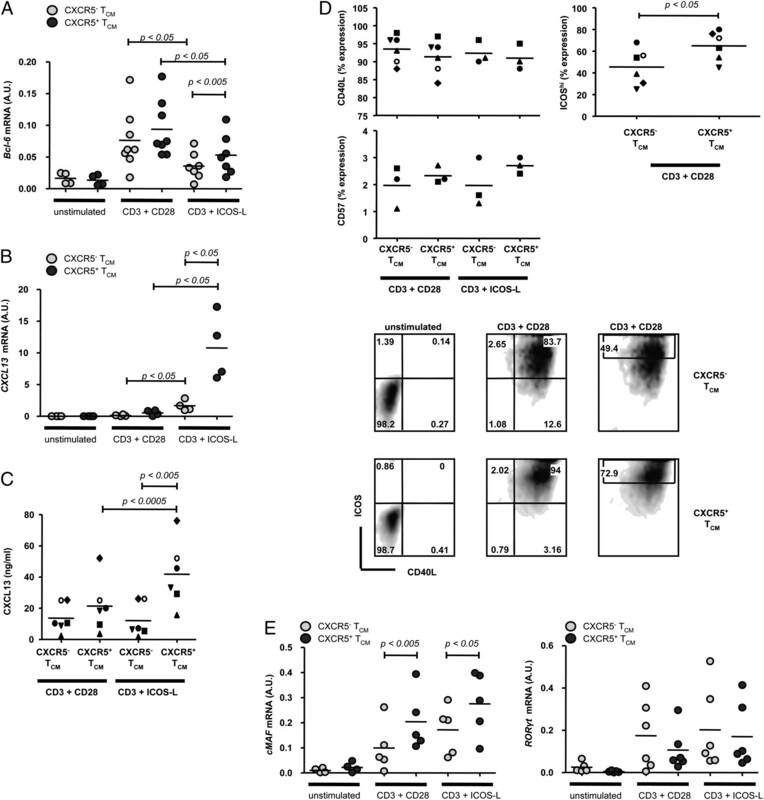 Increased levels of ICOS expression and IL-10 secretion by CXCR5+ TCM account for their greater B cell helper function. A, Purified Vβ2+ CXCR5+ or CXCR5− TCM were incubated with autologous CD19+CD20+ B cells in the presence of TSST for 5 d; cells were then harvested, and expression levels of IL-21, IL-10, IL-4, IFN-γ, and IL-17 were determined by intracellular cytokine staining after restimulation with PMA and ionomycin for 5 h. Each symbol represents cells obtained from different donors; p value was calculated using paired t test; small horizontal bars indicate the grand mean. For IL-21 and IL-10 expression, dot plots are shown of one representative donor. B and C, Purified Vβ2+ CXCR5+ or CXCR5− TCM were incubated with autologous CD19+CD20+ B cells in the presence of TSST. After 5–6 d of culture, CD3+ T cells were either resorted and expression of Bcl-6 and CXCL13 mRNA determined by quantitative PCR (B), or harvested and expression of ICOShi and CD57 determined by flow cytometry (C). Each symbol represents cells obtained from different donors; p value was calculated using paired t test; small horizontal bars indicate the grand mean. Also shown is CD57 expression on CXCR5+ and CXCR5− TCM before and after stimulation on B cells and ICOShi expression after stimulation on B cells (dot plots of one representative donor). D and E, CD19+CD20+ B cells were incubated in the presence or absence of allogeneic purified CXCR5+ or CXCR5− TCM and neutralizing anti–IL-10 and anti–ICOS-L mAbs where indicated. After 6–7 d of culture, cells and supernatants were harvested. The frequency of B cells with a CD38hiCD20− phenotype was determined by flow cytometry, and the levels of secreted IgM, IgA, and IgG were measured by ELISA. D, Shown are Ig levels and the frequency of cells with a CD38hiCD20− phenotype of one donor, and (E) the fold decrease of Ig levels and frequency of CD38hiCD20− cells resulting from B cell-CXCR5+ TCM cultures treated with either anti–IL-10 or anti–ICOS-L mAbs as compared with untreated cultures (four independent donors). The p value was calculated using one-sample t test of the fold difference between treated and untreated cultures with a hypothetical mean value of 1 (treated = untreated CXCR5+ TCM). In view of the fact that different stimulatory conditions may result in a differential expression of genes, cytokines, and costimulatory molecules, and considering the results of 48 h on plate-bound CD3/CD28/ICOS-L stimulation and 5-d stimulation in the presence of B cells side by side, we conclude that on stimulation, CXCR5+ and CXCR5− TCM mainly differ in their responsiveness toward ICOS-L stimulation, production of IL-10, IL-17, and CXCL13, and the adoption of an ICOShi phenotype. CD40L, Bcl-6, IL-21, and IFN-γ were more or less equally expressed by both subsets, consistent with the fact that CXCR5− TCM were also able to induce considerable PC differentiation and Ig secretion by cocultured B cells. 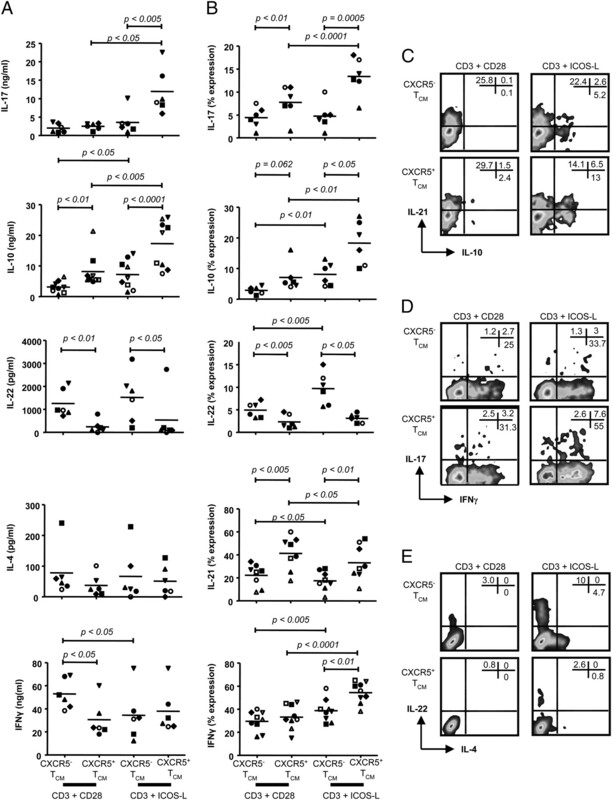 To clarify the effects of IL-21, IL-10, IFN-γ, and IL-17 on Ig secretion by human B cells, naive and memory B cells were stimulated with recombinant CD40L alone or together with IL-10, IL-17, IL-21, or IFN-γ, and secretion of IgM, IgG, and IgA determined after 12 d. This clearly showed that IL-21 was the most efficient inducer of Ig secretion by CD40L-stimulated B cells. Modest Ig secretion could also be achieved in the presence of IL-10; however, neither IL-17 nor IFN-γ had any effect on Ig secretion above that observed for CD40L alone (Supplemental Fig. 9). Based on these results, we conclude that IL-21 secretion by both TCM subsets significantly contributes to the induction of Ig secretion and PC differentiation. Because of comparable levels of Bcl-6, CD40L, and IL-21 in CXCR5+ and CXCR5− TCM, we propose that in CXCR5+ TCM, the higher expression of ICOS and production of the B helper cytokine IL-10 may underlie their increased capacity to provide B cell help. To test this possibility, we cultured CXCR5+ TCM with allogeneic B cells in the presence of neutralizing anti–IL-10 and anti–ICOS-L mAbs. Blockade of ICOS–ICOS-L interactions resulted in a marked decrease of both PC differentiation and Ig secretion as compared with B cell–T cell cocultures without addition of neutralizing mAbs (Fig. 6D, 6E). Neutralization of IL-10 also reduced CXCR5+ TCM-induced B cell differentiation in some experiments (Fig. 6D, 6E). The variable effects of the anti–IL-10 mAbs probably reflected the donor-to-donor variation in IL-10 production, as shown in Fig. 6A (i.e., 4–32% IL-10+ cells). Moreover, variability of Ig secretion both in the absence and presence of neutralizing mAbs is not surprising because donor variability is common and to be expected when working with samples from an outbred human population; likewise, different experimental approaches or culture conditions may result in variable results. Our data clearly show an association between CXCR5 expression on peripheral blood TCM and B cell helper function. We therefore hypothesized that, as compared with CXCR5− TCM, CXCR5+ TCM might be preferentially recruited to CXCL13-rich B cell follicles, and this increases their interaction with B cells rather than other APCs such as dendritic cells (DCs), primarily located in the T cell zone. 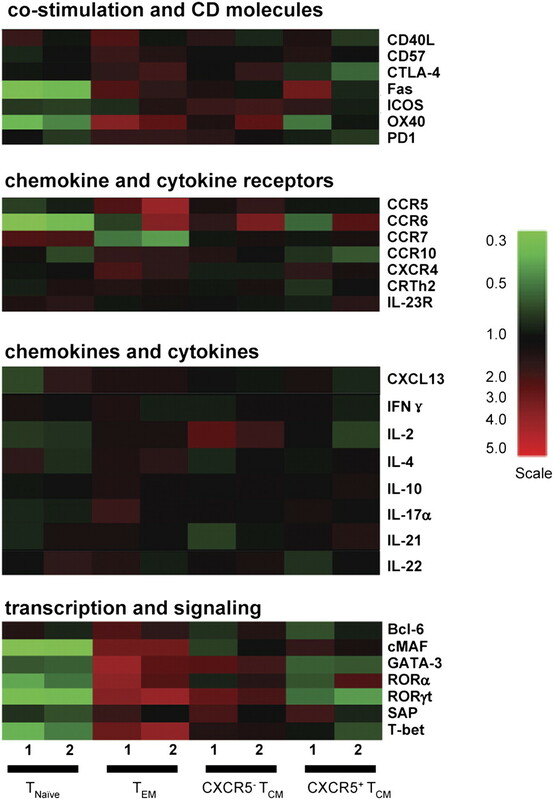 A faster and more numerous interaction between CXCR5+ TCM and B cells might then result in sufficient and more rapid Ig secretion in secondary immune responses. Accordingly, the association between CXCR5 expression and an increased migration toward CXCL13 has been shown for both tonsillar and peripheral blood CD4 T cells (18, 19, 31, 34). We asked whether stimulation of CXCR5+ TCM by B cells is as efficient as stimulation by DCs to induce B cell helper capabilities and the observed high expression of CXCL13. To this end, we stimulated purified TSST-responsive Vβ2+ CXCR5+ and CXCR5− TCM in the presence of TSST on either autologous peripheral blood B cells, cDCs, or pDCs that had been matured overnight by incubation with F(ab′)2 anti-human IgM/IgA/IgG, LPS, or CpG, respectively. After 24 h of stimulation, CD4+ T cells were resorted and either subjected to quantitative PCR analysis for differential CXCL13 mRNA expression (Fig. 7A) or recultured with allogeneic B cells for another 5 d to determine the capacity of differently stimulated T cells to induce PC differentiation and Ig secretion (Fig. 7B, 7C). Consistent with the results obtained after stimulation of CXCR5+ and CXCR5− TCM on B cells or plate-bound CD3/CD28/ICOS-L, CXCL13 secretion, as well as efficient induction of PC differentiation and Ig secretion, was associated with CXCR5 expression on TCM. Interestingly, these features were largely observed only for CXCR5+ TCM stimulated by B cells rather than either pDCs or cDCs. These results support the hypothesis that quick access to B cell follicles followed by cognate interaction with B cells induces efficient and preferential B cell helper function in CXCR5+ TCM over CXCR5− TCM. Only B cell-primed CXCR5+ TCM provide efficient B cell help and express CXCL13. Purified Vβ2+ CXCR5+ or CXCR5− TCM were incubated with autologous B cells, cDCs, or pDCs in the presence of TSST; B cells, cDCs, and pDCs were previously matured by overnight incubation in the presence of F(ab′)2 anti-human IgM/IgA/IgG, LPS, or CpG, respectively. A, After 24 h of culture, CD3+ T cells were resorted and expression of CXCL13 mRNA determined by quantitative PCR. Displayed are the results of three independent experiments as mean + SEM. B and C, After 24-h stimulation, CD4 T cells were resorted and recultured with allogeneic B cells for another 5 d. Cells and supernatants were harvested, and the frequency of cells with a CD38hiCD20− phenotype was determined by flow cytometry (B), and the levels of secreted IgM, IgA, and IgG were measured by ELISA (C) and are displayed as mean + SEM. Data are representative of three independent donors. The distinctive expression of the follicle-homing chemokine receptor CXCR5 on a subset of TCM suggested that these cells may represent a specialized subset of memory-type TFH cells. We therefore performed a detailed characterization of CXCR5+ TCM to determine their relationship with TFH cells and capacity to participate in and support B cell-related immune responses. CXCR5+ TCM did not exhibit the typical TFH cell phenotype ex vivo, or adopt it after in vitro activation under different stimulatory conditions. The CXCR5+ TCM did, however, acquire typical B cell helper characteristics to a greater extent than the corresponding CXCR5− TCM cells. Most prominent was their ability to induce PC differentiation and Ig production, and secrete CXCL13. We attributed the distinct B cell helper qualities of CXCR5+ TCM mainly to their high expression of ICOS, their pronounced responsiveness to ICOS-L costimulation, and production of greater amounts of IL-10. Accordingly, neutralization of ICOS–ICOS-L interactions, and to a lesser extent IL-10, diminished PC differentiation and Ig secretion. The observation that B cell helper functions and CXCL13 secretion were only efficiently induced after stimulation by B cells, but not by DCs, further indicates that CXCR5+ TCM are preferentially recruited, over CXCR5− TCM, to CXCL13-rich follicles. This would assure their preferential interaction with B cells, resulting in a quick and efficient protective humoral immune response. In accordance with previous studies (18, 19, 32, 33), CXCR5+ TCM displayed a relatively unpolarized phenotype as compared with CXCR5− TCM when examined ex vivo. They not only displayed a less pronounced Th1 and Th2, but also Th17/22 polarization (Figs. 2, 3, Supplemental Figs. 4–6), and expressed increased IL-10 and cMAF levels. This differently skewed phenotype supports the notion that CXCR5 expression on TCM defines a memory cell population with a potential for a specialized effector function to take part in humoral immune responses rather than other Th-lineage–specific effector functions. The lesser degree of polarization ex vivo as compared with CXCR5− TCM was originally interpreted that CXCR5+ TCM might fall into a pool of cells at an early stage of memory differentiation (32). Equal TREG numbers and BrdU uptake (32) in both CXCR5+ and CXCR5− TCM subsets, as well as strong responsiveness and distinct differentiation after in vitro stimulation, argue, however, against this interpretation and favor the idea that CXCR5+ TCM represent a memory CD4 T cell population with specialized B cell helper-associated function. Because of their constitutive CXCR5 expression, CXCR5+ TCM may be preferentially and quickly recruited to CXCL13-rich B cell follicles. Furthermore, their less polarized commitment to the Th1/2/17/22 lineages may facilitate their ability to efficiently become TFH-type cells, and thus focus on humoral rather than other inflammatory immune responses that may, in principle, be possible considering the plasticity of CD4 T cell linage differentiation. In a recent study, Morita et al. (61) also concluded that human blood CXCR5+ CD4+ T cells appeared to represent the circulating memory counterpart of TFH cells, and within this broad population they distinguished Th1-, Th2-, and Th17-like precursor subsets based on CXCR3 and CCR6 expression. In our study, CXCR5+ TCM were especially distinguished by higher ICOS levels and a greater responsiveness to ICOS-L stimulation with significantly increased IL-10, IL-17, and CXCL13 secretion, whereas CD40L, Bcl-6, IL-21, and IFN-γ were more or less equally expressed by both subsets. Generally, IL-4 directs GC B cells into memory cells, whereas IL-10 typically steers them toward a PC phenotype (62–64). Also, IL-21 has recently been recognized as a potent PC differentiation factor in human B cells, rapidly generating plasmablasts from naive, memory, and GC B cells in vitro (41, 42, 65, 66). Furthermore, ICOS–ICOS-L interactions have been shown to play an important role in T-dependent Ab responses, Ig class switching, and GC formation (52, 67, 68), and engagement of ICOS on CD4 T cells superinduces IL-10 synthesis (69). In view of the comparable IL-21 expression by both CXCR5+ and CXCR5− TCM, and its strongest effects on Ig secretion by CD40L-stimulated B cells (Supplemental Fig. 9), we are convinced that IL-21 substantially contributes to the B cell helper function exerted by both CXCR5+ and CXCR5− TCM. Because IL-21 production was only slightly different between the two subsets, we propose that in CXCR5+ TCM, especially stronger ICOS–ICOS-L interactions, and to a lesser degree IL-10 secretion, most significantly contributed to their increased B cell helper function. This could be confirmed by diminished PC differentiation and Ig secretion in the presence of neutralizing anti–ICOS-L and anti–IL-10 mAbs. The important role of high levels of ICOS expression on and strong responsiveness toward ICOS-L costimulation of CXCR5+ TCM is also reflected in their increased IL-10 secretion and especially strong induction of IgA secretion by B cells as compared with CXCR5− TCM. Our results differ somewhat from the study by Morita et al. (61), who concluded that IL-21 production was one of the main distinguishing features of CXCR5+ versus CXCR5− TCM. In consideration of the fact that CXCR5+ TCM provide more efficient B cell help than CXCR5− TCM despite equal expression of Bcl-6, we assume that Bcl-6 expressed by CD4 T cells does not itself play a predominant role in this process. Further support for this assumption comes from Ma et al. (30), Rasheed et al. (29), and our own data, showing that tonsillar CD4 T cells that express intermediate levels of CXCR5, yet low levels of Bcl-6, were more efficient in inducing Ig secretion by cocultured B cells than TFH cells that express high levels of Bcl-6. Furthermore, effects of IL-17 and IFN-γ on Ig secretion in human B cells could be excluded (Supplemental Fig. 9). Interestingly, stimulation of CXCR5+ TCM on ICOS-L also resulted in a noticeable expression of the inflammatory cytokines IL-17 and IFN-γ, which was surprising to us in view of the unpolarized phenotype of these cells in their resting state. It is possible that slightly higher cMAF levels, measured in CXCR5+ TCM both ex vivo and after ICOS-L stimulation, resulted in increased IL-17 secretion. This would be consistent with cMAF, downstream of ICOS, regulating IL-21 production by Th17 and TFH cells (59), providing further reason to speculate that cMAF may indirectly contribute to B cell differentiation and Ig secretion via the induction of IL-21. Dysregulation of TFH cell function may underpin certain types of autoimmune diseases. For instance, sanroque mice, which carry a mutation in the gene encoding the ICOS repressor roquin, develop a severe autoimmune lupus-like disease with accumulation of CXCR5+ICOShi TFH cells, GC formation, and autoantibody production (28, 70). Furthermore, an increased fraction of ICOS+ (71–73) and circulating CXCR5+ICOShi TFH-like cells (74) has been detected in the peripheral blood of systemic lupus erythematosus patients, most probably reflecting the dysregulated GC reaction, which correlates with titers of autoAbs and severity of end-organ involvement. Based on their prominent IL-17 secretion when stimulated in the presence of ICOS-L, their expression of high ICOS levels, and ability to promote humoral immune responses, we propose that CXCR5+ TCM perform specialized helper functions in inflammatory settings such as autoimmune diseases. Patients with juvenile dermatomyositis, a poorly understood systemic autoimmune disease, had expanded Th2-like and Th17-like CXCR5+ CD4+ T cells in the blood (61). These two subsets, in particular, may provide for excessive B cell help in this autoimmune disease. The enumeration and/or activation of CXCR5+ TCM in patients offers a new opportunity for a marker of disease activity, particularly in Ab-mediated autoimmune diseases. One interesting feature of CXCR5+ TCM was their high expression and production of CXCL13. CXCL13 is required for the normal organization of B cell follicles in secondary lymphoid tissues (75), as well as ectopic lymphoid tissue neogenesis when overexpressed in extralymphoid sites (76). The function of ectopic lymphoid follicles remains incompletely defined, but they most probably support the pathogenesis of autoimmune diseases by contributing to the generation of high-affinity autoantibodies; in accordance with that, CXCL13 levels in autoantibody-mediated autoimmune diseases correlated with disease severity and progressive organization of tertiary lymphoid-like structures (77, 78). The observation that CXCL13 expression by infiltrating memory CD4 T cells is required for ectopic GC progression (77, 79) makes CXCR5+ TCM potential candidates to be recruited to these sites and perform their effector functions after adequate stimulation. These may include the support of humoral immune responses, the progression of the follicular response by CXCL13 secretion, and maintenance of the inflammatory milieu by secreting inflammatory cytokines. This hypothesis, as well as the still unclear question of which phenotype is adopted by CXCR5+ TCM after their recruitment to follicles, may ideally and properly be answered by means of future in vivo models. Even if some TFH characteristics like ICOShi, CD57, and CXCL13 were preferentially upregulated on stimulated CXCR5+ TCM in vitro, a full and typical TFH phenotype was not acquired. This may be because differentiation into archetype TFH cells does not occur, or more likely reflects limitations of the in vitro system. Further support for the idea that CXCR5 expression on memory T cells is generally and preferentially associated with humoral immune responses comes from studies showing that human CXCR5+ Vγ9Vδ5 γδ T cells and CD8 T cells display better B cell helper characteristics over their CXCR5− counterparts (80, 81). Likewise, evidence for the importance of circulating CXCR5 expressing CD4 T cells for proper humoral immune responses comes from Bossaller et al. (31), demonstrating a profound diminution of circulating CXCR5+ CD4 T cells in human ICOS deficiency that typically goes along with the clinical phenotype of common variable immunodeficiency. Our detailed characterization of CXCR5+ TCM in human peripheral blood represents an important advance in understanding the so far uncertain function of these cells. We clearly show that in human peripheral blood, CXCR5 expression marks a memory CD4 T cell population with potential for specialized B cell helper functions. Given the predominant role of CXCR5 expressing memory T cells in Ab-mediated immune responses, CXCR5+ TCM may serve as a useful biomarker, for instance, to examine vaccination strategies or to stratify or monitor treatment of certain autoimmune or immunodeficiency patients. We thank Santi Suryani for help with microarray data, Thomas Hambridge for help with RT-PCR, and the Garvan Institute Flow Facility (Christopher Brownlee and Nikki Alling) for help with cell sorting. This work was supported by the National Health and Medical Research Council of Australia (to C.S.M., S.G.T., and C.R.M. ), Swiss National Science Foundation Grant N. 131092 (to F.S. ), and a Deutsche Forschungsgemeinschaft/German Science Foundation Research Fellowship (CH 818/1-1 to N.C.). The Institute for Research in Biomedicine is supported by the Helmut Horten Foundation.
. 1998. T cell memory. Annu. Rev. Immunol. 16: 201–223.
. 2004. Chemoattractants and their receptors in homeostasis and inflammation. Curr. Opin. Immunol. 16: 724–731.
. 2000. T-cell function and migration. Two sides of the same coin. N. Engl. J. Med. 343: 1020–1034.
. 1994. Entry of naive CD4 T cells into peripheral lymph nodes requires L-selectin. J. Exp. Med. 180: 2401–2406.
. 2003. Memory and flexibility of cytokine gene expression as separable properties of human T(H)1 and T(H)2 lymphocytes. Nat. Immunol. 4: 78–86.
. 1997. Phenotypic and functional separation of memory and effector human CD8+ T cells. J. Exp. Med. 186: 1407–1418.
. 2003. Ex vivo characterization of human CD8+ T subsets with distinct replicative history and partial effector functions. Blood 102: 1779–1787.
. 2002. Differentiation of human CD8(+) T cells from a memory to memory/effector phenotype. J. Immunol. 168: 5538–5550.
. 2004. Central memory and effector memory T cell subsets: function, generation, and maintenance. Annu. Rev. Immunol. 22: 745–763.
. 2000. Dynamics of T lymphocyte responses: intermediates, effectors, and memory cells. Science 290: 92–97.
. 2001. 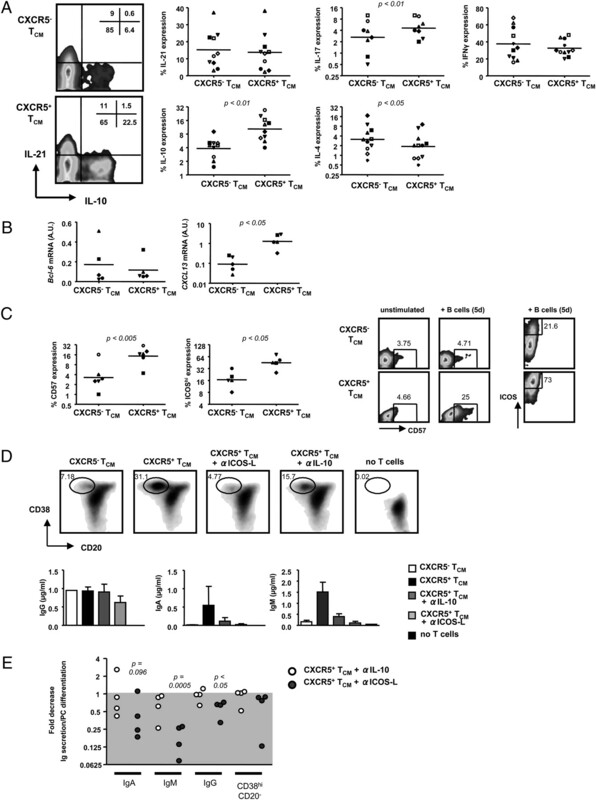 Subspecialization of CXCR5+ T cells: B helper activity is focused in a germinal center-localized subset of CXCR5+ T cells. J. Exp. Med. 193: 1373–1381.
. 1996. A putative chemokine receptor, BLR1, directs B cell migration to defined lymphoid organs and specific anatomic compartments of the spleen. Cell 87: 1037–1047.
. 2009. Lineage specification and heterogeneity of T follicular helper cells. Curr. Opin. Immunol. 21: 619–625.
. 2004. Unique gene expression program of human germinal center T helper cells. Blood 104: 1952–1960.
. 2006. Follicular B helper T cell activity is confined to CXCR5(hi)ICOS(hi) CD4 T cells and is independent of CD57 expression. Eur. J. Immunol. 36: 1892–1903.
. 2009. Early commitment of naïve human CD4(+) T cells to the T follicular helper (T(FH)) cell lineage is induced by IL-12. Immunol. Cell Biol. 87: 590–600.
. 2006. ICOS deficiency is associated with a severe reduction of CXCR5+CD4 germinal center Th cells. J. Immunol. 177: 4927–4932.
. 2001. Cutting edge: induction of follicular homing precedes effector Th cell development. J. Immunol. 167: 6082–6086.
. 2002. CXCR5(+) T cells: follicular homing takes center stage in T-helper-cell responses. Trends Immunol. 23: 250–254.
. 2003. Kinetics and expression patterns of chemokine receptors in human CD4+ T lymphocytes primed by myeloid or plasmacytoid dendritic cells. Eur. J. Immunol. 33: 474–482.
. 1993. T cells within germinal centers are specific for the immunizing antigen. J. Immunol. 151: 4505–4512.
. 1994. Visualization of peptide-specific T cell immunity and peripheral tolerance induction in vivo. Immunity 1: 327–339.
. 2010. B cell-intrinsic signaling through IL-21 receptor and STAT3 is required for establishing long-lived antibody responses in humans. J. Exp. Med. 207: 155–171.
. 2003. IgG subclass concentrations in certified reference material 470 and reference values for children and adults determined with the binding site reagents. Clin. Chem. 49: 1924–1929.
. 2006. Human germinal center T cells are unique Th cells with high propensity for apoptosis induction. Int. Immunol. 18: 1337–1345.
. 2009. Production of interleukin 22 but not interleukin 17 by a subset of human skin-homing memory T cells. Nat. Immunol. 10: 857–863.
. 2008. Human T cells that are able to produce IL-17 express the chemokine receptor CCR6. J. Immunol. 180: 214–221.
. 2001. ICOS is critical for CD40-mediated antibody class switching. Nature 409: 102–105.
. 2004. Germinal center dark and light zone organization is mediated by CXCR4 and CXCR5. Nat. Immunol. 5: 943–952.
. 1994. B cells regulate expression of CD40 ligand on activated T cells by lowering the mRNA level and through the release of soluble CD40. Eur. J. Immunol. 24: 787–792.
. 2007. Essential role of IL-21 in B cell activation, expansion, and plasma cell generation during CD4+ T cell-B cell collaboration. J. Immunol. 179: 5886–5896.
. 2003. Homozygous loss of ICOS is associated with adult-onset common variable immunodeficiency. Nat. Immunol. 4: 261–268.
. 2004. Involvement of inducible costimulator in the exaggerated memory B cell and plasma cell generation in systemic lupus erythematosus. Arthritis Rheum. 50: 3211–3220.
. 2006. Expression and function of inducible co-stimulator in patients with systemic lupus erythematosus: possible involvement in excessive interferon-gamma and anti-double-stranded DNA antibody production. Arthritis Res. Ther. 8: R62.
. 2005. Expression and function of inducible costimulator on peripheral blood T cells in patients with systemic lupus erythematosus. Rheumatology (Oxford) 44: 1245–1254.
. 2000. A chemokine-driven positive feedback loop organizes lymphoid follicles. Nature 406: 309–314.
. 2000. BLC expression in pancreatic islets causes B cell recruitment and lymphotoxin-dependent lymphoid neogenesis. Immunity 12: 471–481.
. 2005. Association of CXCL13 and CCL21 expression with the progressive organization of lymphoid-like structures in Sjögren’s syndrome. Arthritis Rheum. 52: 1773–1784.
. 2010. Elevated production of B cell chemokine CXCL13 is correlated with systemic lupus erythematosus disease activity. J. Clin. Immunol. 30: 45–52.
. 2008. Mature antigen-experienced T helper cells synthesize and secrete the B cell chemoattractant CXCL13 in the inflammatory environment of the rheumatoid joint. Arthritis Rheum. 58: 3377–3387.
. 2006. CXCR5 identifies a subset of Vgamma9Vdelta2 T cells which secrete IL-4 and IL-10 and help B cells for antibody production. J. Immunol. 177: 5290–5295.
. 2007. CXCR5+ CCR7- CD8 T cells are early effector memory cells that infiltrate tonsil B cell follicles. Eur. J. Immunol. 37: 3352–3362.